I am so happy to introduce you to Joy. I don’t quite remember how we first met but I’m in love with her recipes and reviews about restaurants in the Bay Area. Yes, she’s truly a foodie. Her website is always full of delicious recipes and pictures of restaurants she has visited. Though we both live in the Bay Area, there are still tons of restaurants that I haven’t been to and reading her review makes me eager to try all of them (… and oh, her kids are super adorable. One of these days I will offer to babysit for her). Anyway, I’m the blogger behind The Joyful Foodie, and I’m so stoked to be here today. Linda is one of the sweetest people (as you all know), so I was honored when she asked me to guest post for her. Until I discovered slow roasting tomatoes. Then the skies opened, angels started dancing, and I finally felt like one of the cool kids who actually ate tomatoes. Seriously. The flavors changed so much! Slow roasting the tomatoes makes them kind of sweet, kind of tart. Almost like a sundried tomato except so much better. If you love tomatoes and haven’t tried this yet, you must. If you hate tomatoes and haven’t tried this yet, you must. Trust me. This recipe is my peace offering to tomatoes for decades of avoidance. 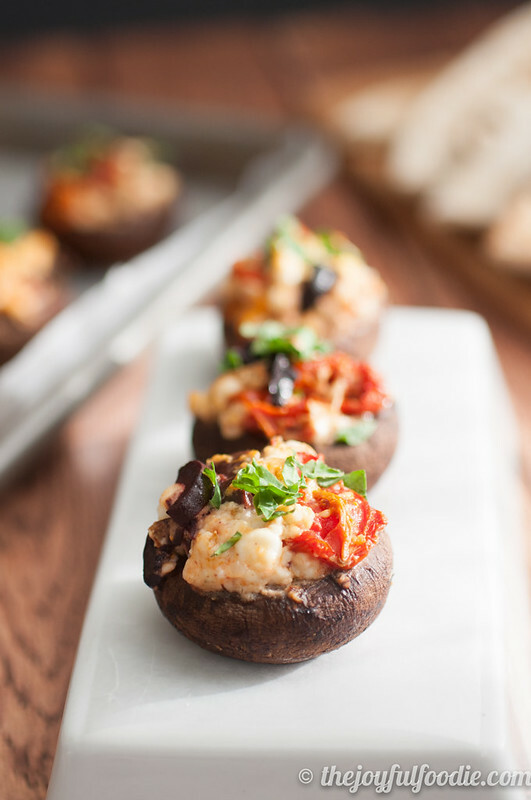 I’ve not only allowed them into my home, I’ve given them the a-okay to play with three of my favorite things in the world – mushrooms, olives and cheese. They get along swimmingly. 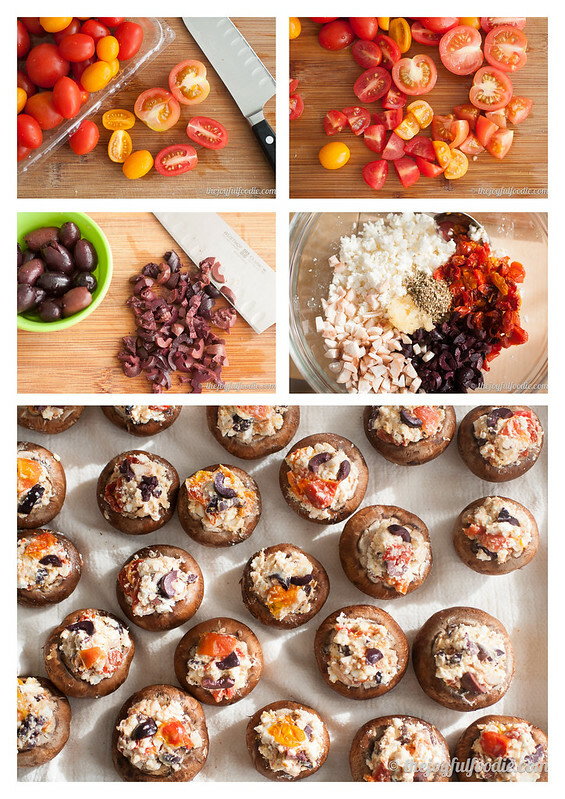 Sweet roasted tomatoes, tangy feta, salty olives all piled into chewy mushroom caps. No matter your stance on tomatoes, I urge you to try these. They really are as flavorful as they sound. Have you ever hated something then later found a way to get along? Slice tomatoes into fourths and place in a baking dish. Sprinkle with salt and drizzle with olive oil. Roast in the oven for one and a half to two hours. Clean mushrooms well and remove stems. Dice the stems and set aside. Mince or press the garlic. When the tomatoes are done roasting, remove them from the oven and turn the heat up to 375 degrees F.
Crumble the feta into a bowl and add the roasted tomatoes, olives, garlic, 1/3 cup of the chopped stems and pepper to taste. Generously stuff mushroom caps with the cheese mixture. 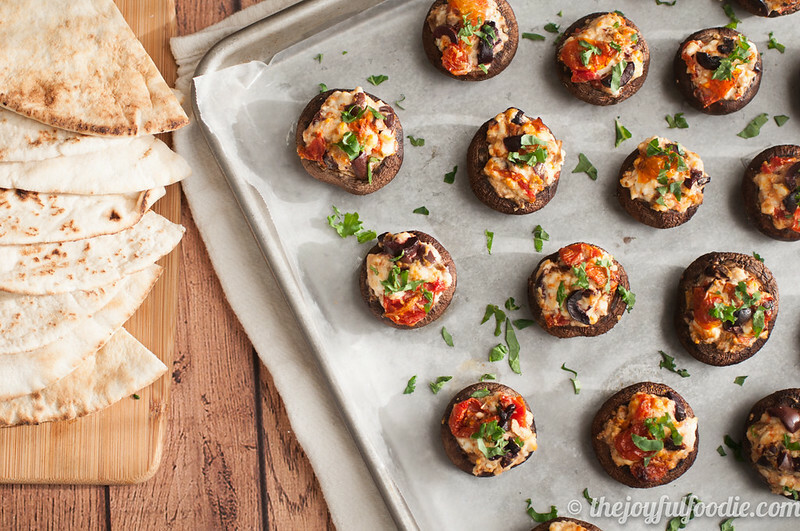 Bake for 15-20 minutes or until the mushrooms are cooked through. 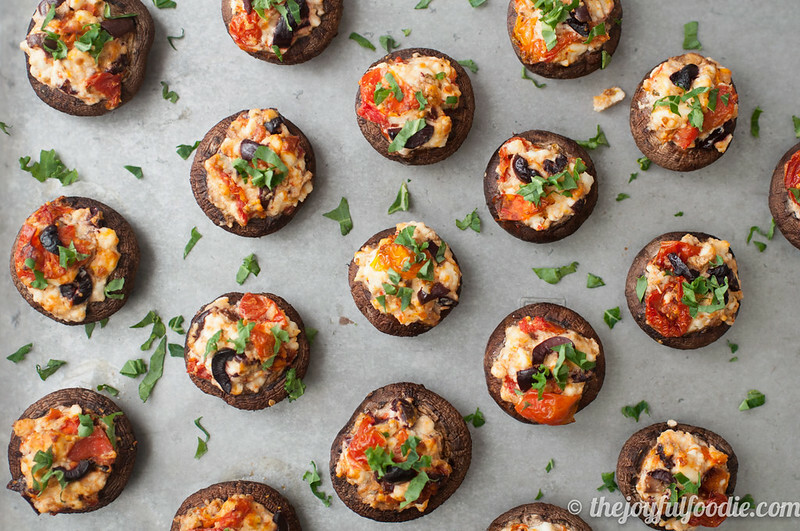 Those are the prettiest stuffed mushrooms I have ever seen. I bet they taste amazing! These are so beautiful, and I love those flavors together! Thanks, Lindsay. 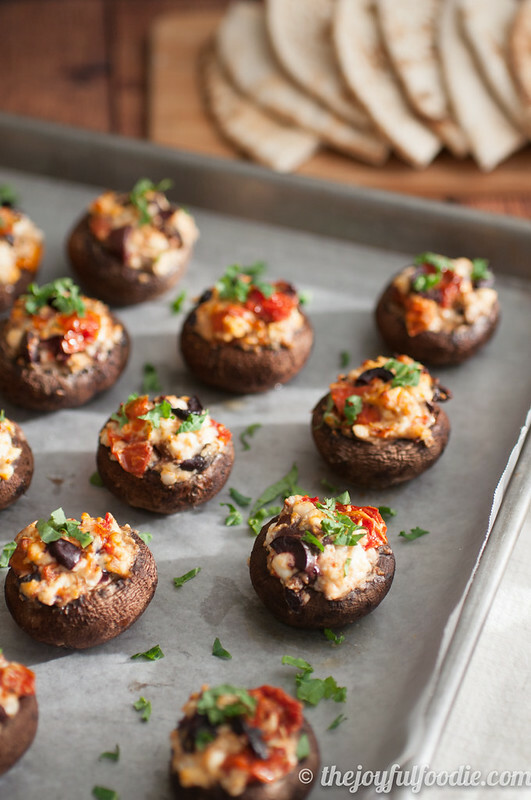 These mushrooms are so mouthwatering…. Hi Joy!! Nice to meet you. These mushrooms are just amazing!! Indeed – so glad you stop by, Zainab! I used to dislike seafood as a child but now adore it! It’s funny how we change. Nice to be introduced to another blog!